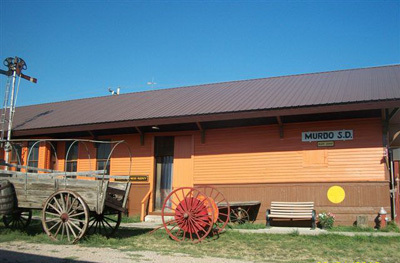 What better way to spend at least a day than at a veritable Western version of the "Smithsonian" museum located on the wind-swept prairie of South Dakota? If you take us up on this idea, you'll be among 100,000 or so other visitors that show up here each season – and the season in South Dakota is mainly June through October. We drove into the otherwise nondescript, little town of Murdo located between the two major cities of the State – Sioux Falls and Rapid City – and we never dreamed what awaited us just a block off Interstate 90. We saw some signs advertising a Pioneer Car Show and Prairie Town, but what we found was much more than the signs seem to suggest. 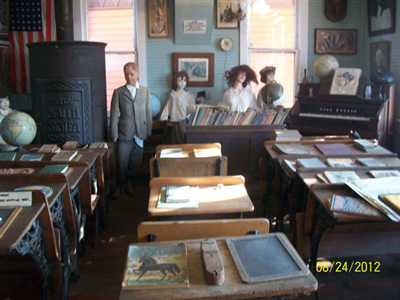 We promise that, if you go, you will be transported back in time as far as the 1880s -- and then vaulted forward through the entire 1900's and into the modern era. Forty-two buildings in the Pioneer Auto Show are filled with an amazing, almost mind-boggling display of over 250 vintage cars -- including classic cars, muscle cars, antique cars, dozens of motorcycles, 60 tractors and even an 1890 big, old, black, horse-drawn hearse. All are close enough to touch. There's even a special display featuring a mannequin of Elvis Presley riding his pride and joy, an impressive turquoise and black Harley-Davidson. His shirt even matches the colors of the bike. All comprise the largest private collection of these kinds of vehicles in America. You can also stroll through a "prairie town" authentically dating back more than a hundred years, with a jail, homesteader's cabin, barber shop, blacksmith shop, and a one-room schoolhouse looking as it did so many years ago -- complete with open books, slates, and chalk on the desks, as well as a pot-bellied stove, tin lunch pails, and those beautiful, old penmanship charts on the upper walls. Note: Many of the relics are of the vintage of Wilder's Little House on the Prairie. One big room of the 42 is designated as National Rockhound and Lapidary Hall of Fame. Here lighted display cases are filled with everything collectors will enjoy viewing. There are hundreds of toy cars on display, plus old typewriters and Edison phonographs, dust-covered dental chairs, dental drills and even old metal tooth molds. 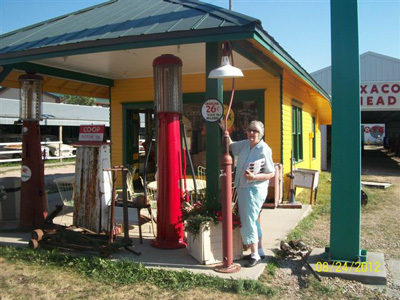 And there's an old time service station to boot. Current owner, Dave Geisler, is justifiably proud of his huge collection. 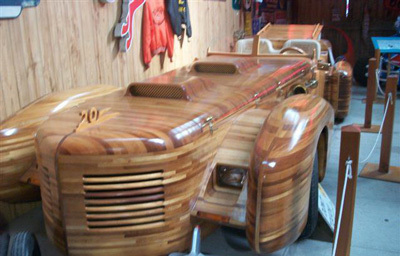 He recently returned from the massive Pebble Beach Car Show with a trophy for one of his restored classic cars. His father, A.J. Geisler, launched the whole venture back in 1954, and the 50th anniversary was celebrated eight years ago. Then in August of 2011, the TV show, American Pickers, filmed a segment for national viewing. This entire venue is also a kid-friendly place that provides an education as an added feature. Dave has pre-recorded stories in many of the buildings explaining the various displays. All a visitor has to do is press a button, and Dave talks away. Meanwhile, kids can also have fun gathering stickers for a well-planned treasure hunt. 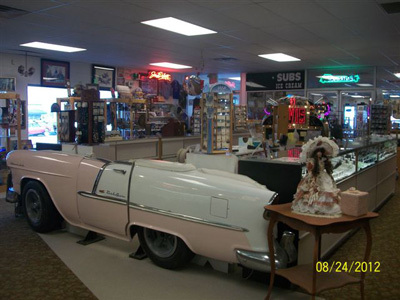 In addition to all the above displays, Dave's museum features a large, well-designed, Hallmark gift shop and a restaurant featuring '50's décor. Tasty buffalo burgers are on the menu. Another delightful and totally unexpected surprise that awaited us in Murdo was staying at the pristine LandMARK Country Inn. Note: the MARK part of the name is emphasized because of the congenial innkeeper's name, Mark Sanderson, and the "land" for the surrounding endless miles and miles of prairie. This one-of-a-kind motel sits on 30 expansive acres just a block from the main street of town. As one approaches the property on the sloping hillside, evergreen trees and waving American flags on the hillside are all part of the welcoming atmosphere. "Luxury Accommodations at an Affordable Price" is part of the advertising for this luxurious inn, and prices start at amazingly low rates. There are suites with sunken tubs, hot tubs or whirlpools, as well as free in-room movies, music, and HBO, as well as themed rooms beautifully decorated with attention to every detail. Everything on site is impeccably clean. There's also an inviting new indoor heated pool set at 90 degrees. The blue water is so clear it shimmers like polished crystal. There's poolside TV, and swimming's allowed until midnight. Rounding out the amenities are a continental breakfast, a small video arcade, antiques in display cases for sale, a playground and volleyball equipment. Book well ahead, if possible. Here again the season is just five months (June through October). Phone number is 605-669-2846.